What is long-arm quilting or what is a long-arm quilting machine? Long Arm quilting is the process by which an industrial machine, called a long-arm quilting machine, is used to sew or quilt together the quilt top, the batting and the backing together (collectively called the "quilt sandwich"). When using traditional or home sewing machines, quilts or fabrics are moved under the machine, while the machine stays stationary. In long-arm quilting, the quilt is mounted on a frame, and stays stationary, while the machine moves over the quilt. Our machine is mounted on a 12 foot long table. For a picture of our machine, see the picture on our home and studio pages. What is a pantograph quilting design? This is a quilting design that covers the quilt from edge to edge. This design is complementary to the quilt top design, but quilted without regard to the piecing of the quilt top. Many times this can be the right choice for a quilt top for when a quilt top is colorful or busy. Many times the choice to use the method of quilting is made because the cost is substantially less than custom quilting. The pantograph design is placed on the long-arm table. Using the machine's laser light, the long-arm quilter will trace the design, which transfers the design to the sewing head and to the quilt. As the design is traced, the quilt is quilted. The design spans the length of the quilt and is repeated in rows to produce an all-over design on the quilt top. Custom quilting is quilting that is done all over the quilt. However, there are usually a couple designs and they are placed on the quilt depending on the design of the quilt top. Each quilt blocks or quilt area will contain individual designs. This method is typically more time consuming for the long-arm quilter and is the more expensive method for having a piece quilted. Some other quilters have a computer. How does that affect your quilting? My machine quilting is all hand-guided. I do not have a computer, as many other long-arm quilters do. So all my designs are hand guided. This means that there may be certain artistic imperfections in each design. They will look great on your quilt, but they will not be perfect, as a computer can make them. I personally feel that having a hand-guided quilting leaves the human touch in a quilt. You can know that as I was stitching each inch of your quilt, I was thinking about the quilt, the quilt owner, and the person who was going to receive the quilt. Why should I purchase my batting from you? We can provide 100% cotton Warm & Natural batting for you. Our prices are competitive with local shops. We purchase batting in bulk on a roll. Packaged batting typically has many more wrinkles than rolled batting. It's cheaper for you. We charge by the square inch for the dimensions of your quilt top. So you are only paying for batting that is actually used in your quilt. In a packaged batting, you are limited to certain sizes and there is almost always waste. Below are some examples of pantograph quilting. We have over 100 patterns to choose from. $ .016 cents per square inch. We also have a large inventory of other cotton fabrics always in stock. They are a wide variety of manufacturers, but all 100% cotton and all quilt shop quality fabric. Bonus: if you choose to purchase your backing from us, there is no charge to piece your backing. price varies depending on yardage. (no charge when you purchase your backing from us). This is a fabric pocket that is sewn into the binding. It is a great way to hang your quilt without putting stress on the quilt fibers itself. We have computer labels that we can color print on muslin cotton on my ink jet printer. Then customize them to what you would want to say (particularly if this were a gift quilt). 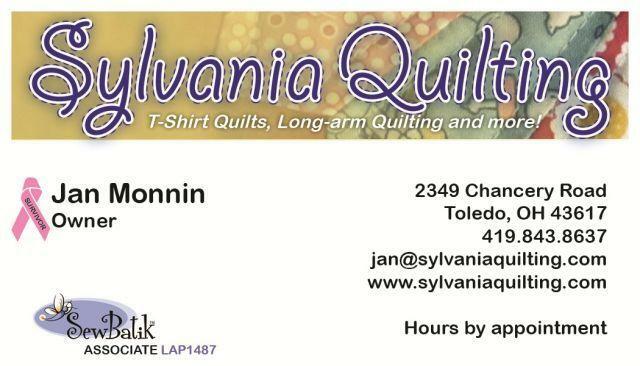 Teaching time - Our owner, Jan Monnin, is available to teach you how to make, sew or attach your binding for yourself. For example, let's say you bring in a twin size quilt. Let's say 60" x 80" (4800 square inches). We will answer any questions you might have about your quilt. We require a 50% deposit before any work will begin. Return check fee of $ 25.00. In order to avoid unnecessary charges and wasted time on both our part and the quilter's part, please read the following instructions carefully. Following them will ensure that we will both have good results. 1. If you make an appointment, please make every effort to be prompt. Professional long-arm quilters are usually very busy people and their time is just as valuable as going to your doctor's office. We may wait for a while if you are late, but if you are going to be very late, please be courteous and call. Be understanding if we have to reschedule your appointment. If you are piecing the backing yourself, make sure the seam runs horizontal on the backing (not vertical). The backing must be at least 5 inches bigger than the quilt top, all the way around. This is required for loading on a long arm quilting machine. Square up your backing. This is important so that when the quilt is loaded, there is a minimal pleats and tucks on the edges. Remove the selvages from your backing before piecing. The selvages are a higher thread count than the rest of the fabric and therefore are tighter. If they are left in tact on the backing, these edges will stay tight while the rest of the body will sag and create tucks and pleats. No sheets for your backing. They are a much tighter weave and will not quilt as nicely as quality cotton fabric. 3. To get an idea of what the quilting charge would be, you first need to determine the number of square inches of quilting to be done. Figure this out by measuring the width x the length of the quilt top. The result will give you total square inches. Multiply this number by $.015 and this will give you the quilting charge. 4. Iron your batting and backing. Make sure your seams are as flat as possible. If they are not, it is possible that there may be pleats and puckers on the finished quilt, no matter how careful or skillful we are. 5. We will give you an estimated completion date for your quilt top. It can be anywhere from 1 month - 2 months. Most of the time we get it back to you way before then, but please be patient. 6. Feel free to suggest quilting ideas, but be flexible enough to hear our ideas about your quilt top. Through experience, we may be able to suggest creative ideas that will enhance the beauty of your quilt. By asking questions and listening carefully to the answers, you can make informed decisions on your quilt. If we both have the same expectations and are both aware of possible issues in whatever is chosen, we can develop a long-term mutually satisfying relationship. Remember, that we treat each quilt as if it were our own. We know the time and expense that goes into each quilt top. Our goal is for every customer of ours to be a lifelong client.